As fitness is gaining popularity amongst people, the need for good fitness equipments is on the rise. One of the most popular fitness equipment used nowadays is the treadmill. Though treadmills were a simple piece of equipments earlier, lately they are much advanced and also combine two or more exercising routines in them. A treadmill is considered to be a good exercise and workout equipment. With a wide variety of treadmills available in the market with a host of features, finding a treadmill to suit your needs and exercising routing should not be tough. A treadmill has many advantages over walking outdoors. One of the major advantages is that you can workout regardless of what the weather is. Let it be a windy or raining or any other natural phenomenon like sleet, snow or hail – you can be rest assured that your workout routine would not be hampered due to the weather. Also a treadmill gives you the option to workout anytime of the day you want. Night or day, the treadmill would be your own 24/7 gym. Once you have your own treadmill no longer would you have to worry about the gym timings for your workout! The outdoors can be risky even if you are careful. The possibility of you getting injured while walking or running outdoors is three times more likely. Added to this is the fact that your foot is steadier while you walk on a treadmill as you walk on a perfectly flat surface unlike outdoors where you cannot always be guaranteed of a flat surface. Walking on hard surfaces can wear out your knees a lot more when compared to walking on soft surfaces. Treadmill running surfaces are soft and are designed to give the least amount of shock to your knees and legs as possible. Our lives today depend on multi-tasking and treadmills allow you to do just that as you are getting your much needed exercise. While on the treadmill you can read a book, watch any of your favorite shows or even talk over the phone. Imagine reading a book or a newspaper while walking or jogging outdoors – could lead to a trip to the emergency room. There is a myth that the amount of calories burnt outdoors is more than that on the treadmill. But the truth is that the calories burnt on a treadmill are the same as what is burnt when walking or jogging outside. With the newer treadmills with the inclination facilities, the calories burnt is more than what you can burn walking or jogging outdoors. For those who are very careful about their health and hygiene, working on a treadmill inside your house greatly reduces the possibility of your exposure to germs that are found outside. Your contact with people while exercising is very less when on a treadmill and that can help you to stay away from sick people who can spread their germs to you. Above all you would have the opportunity to sweat a bit more when compared to walking or jogging outside. A cool breeze will tend to make you sweat less while exercising outside whereas indoors you can exercise in a controlled environment. Treadmills are available in the many shapes, sizes and of different materials. 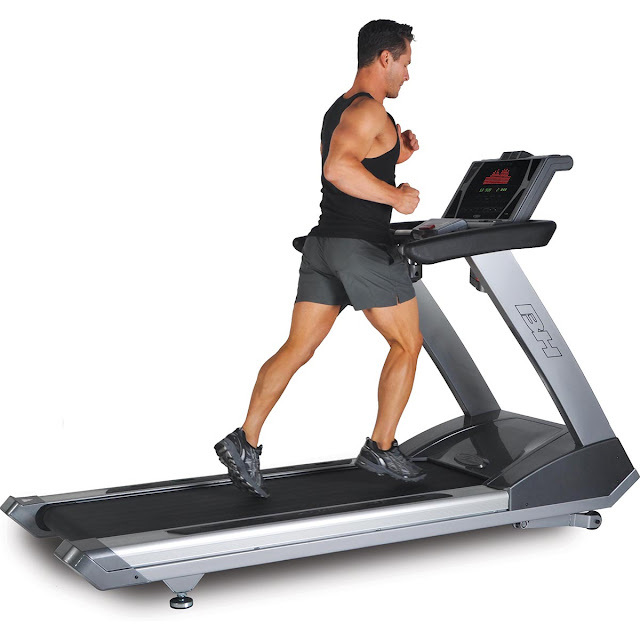 The major types of treadmills are motorized, manual, folding and stationary treadmills. A manual treadmill run on your power and is very basic in construction – but not in use much nowadays. The motorized treadmill has a motor which moves the belt enabling you to run on it. Most treadmills in use now are motorized treadmills. The stationary models are sturdier and heavier than folding ones. Do remember that treadmills take up a lot of abuse from you as you keep running on them, so getting a good quality treadmill is important if you want the treadmill to last long. The growth of treadmills over the years has been significant and stable. A very basic exercise like walking and jogging has been the basic principle on which a treadmill has been constructed. And this is the major advantage of treadmills – the fact that it is simple to use and you need not have to do anything special on it. Just walk or jog on a treadmill as you would do outside. Treadmills nowadays give out a lot of information about your body as you are exercising. Your heart rate, amount of calories burnt, number of miles you have run and some advanced models can display your body temperature and also your blood pressure. With so much information available to you, it becomes easier for you to plan your exercise routine. If you have less time, then treadmills with inclination function can help you burn a lot more calories in a lot more time. All treadmills nowadays come equipped with a safety feature that stops immediately when you lose your balance. With lot of safety features being added to treadmills, the time spent on a treadmill can be fruitful and also safe. Most importantly, just buying a treadmill will not keep you fit. The amount of calories burnt by you is directly proportional to the time you spend on the treadmill. So, to lose weight and be fit, exercise regularly and integrate time to spend on the treadmill into your exercising routine. What to Do To Get Rid of Bed Bugs?